Behind this door lurks genius. Delicious genius. 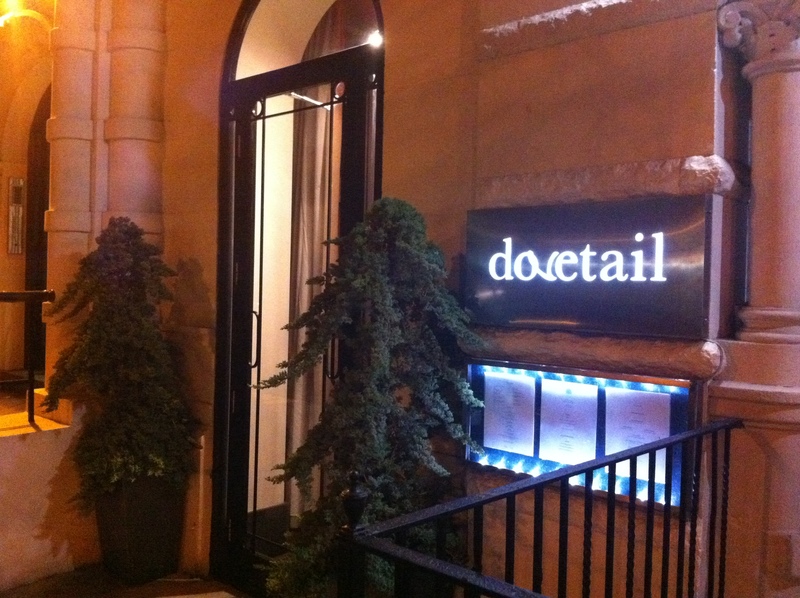 It’s hard to write about Dovetail without giving it an out and out rave. The food is exceptional, the quality of cooking, the balance and mixing of flavors (which I am guessing gives rise to the name of the place), it’s something special. It’s a bit too ostentatious for any place to call itself “Genius At Work,” but Dovetail may as well, the food is just so delicious. At many of the high-flying restaurants I’ve dined at in town, you do indeed get savory and delicious food, but if you pay attention to the flavors, you’ll often notice that there is a strong emphasis on rich and buttery. Dovetail deviates from that tried-and-true method of cooking to offer you complexity on a plate, often leaving you feeling refreshed and invigorated as opposed to leaden and heavy. Often restaurants of Dovetail’s quality offer a tasting menu, and it should come as no surprise that those tasting menus can be quite expensive. A la carte isn’t what you might call “cheap” either, but these are the kinds of places that (unless you are extremely wealthy) you’re going to be dining out on special occasions. That's just the appetizers, above... . 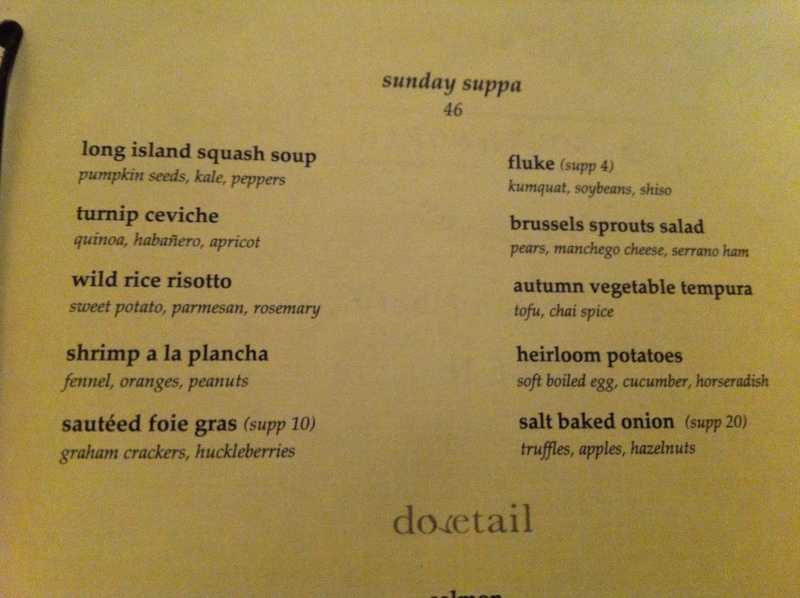 Which is why Dovetail’s “Sunday Suppa” is such a wonderful idea and frankly seems a bit of a steal. At this (often packed) event, you can get a beautiful three course meal for $46. Considering the quality of the food, it might be the best deal in town. I know, I know, it’s not cheap (I mean, one could argue Mamoun’s $2.50 falafel is a better deal), but I’m not arguing that point. Dinner for two out can often run upwards of $100 (or north of it), so the notion that you can get a meal of this finesse and quality at that price point is just utterly winning. Of course, once you slap on drinks or a bottle of wine, well, the sky’s the limit. However that should not dissuade you from going and trying this wondrous food. In fact, the only reason I would dissuade you from trying it is because you will make it more difficult for me to get a table. It can get a touch louder than you'd think on Sunday nights... .
As far as decor goes, Dovetail is a large rectangle with an offset bar area. There are some exposed brick areas and the place feels modern. I suppose a better, more “designer-y” word would be “contemporary.” The vibe of the place bridges the gap between fancy and functional. You’ll be greeted by someone wearing an expensive-looking suit, you will be doted on, the servers will be extremely attentive. It’s a high level of service. The amuse bouche. That's cornbread with cheese in the background. 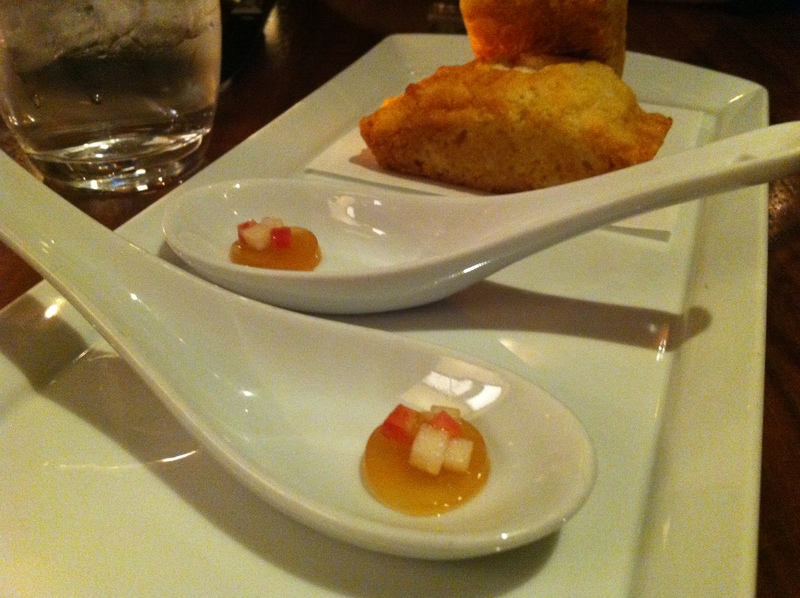 On our most recent occasion we were served an apple-based amuse bouche and some cornbread. The apple gelee was crisp and a terrific palette cleanser. Once again, another fantastic start at Dovetail. I sing of song of salt baked onions. Delicious, layered with truffle. This time they had something unusual on the menu: a salt baked onion. They wanted a $20(!) supplemental charge for it. I opted to try it (every time I’ve been to this place, chef/owner John Fraser’s work dazzles, so why not go for it). Needless to say, it was absolutely ridiculous. 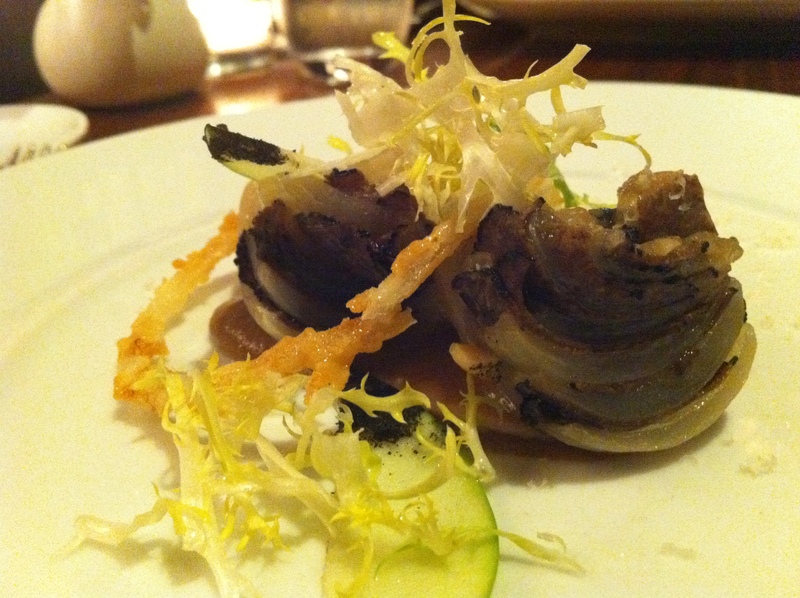 There were truffles inserted between the layers of onion. The whole thing was truffly, oniony with a hint of salt. It was wonderful. Looks a bit like some '60's pop art. For my main course, I opted for the swordfish. 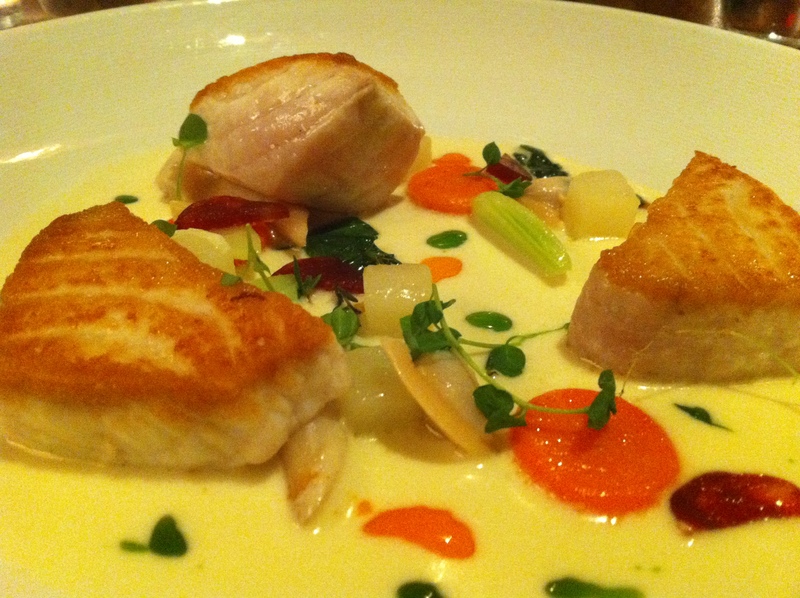 My server put it best: It was essentially a deconstructed New England clam chowder. The chunks of swordfish were beautifully prepared, fresh and light, served on top of a sauce that tasted creamy and delicious, with some pieces of potato, clam and chorizo. It was again mouth-wateringly delicious. I'm sorry I've forgotten the name of the pastry chef. She's brilliant. 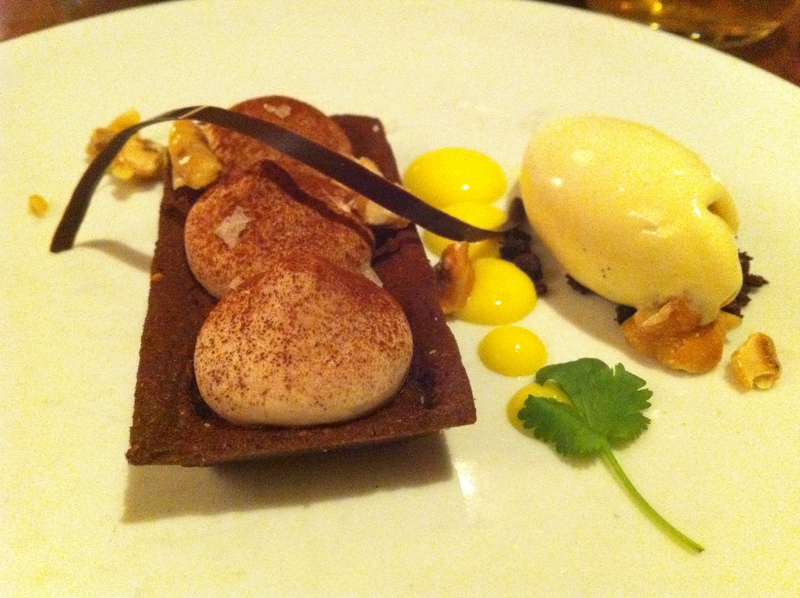 For dessert, we indulged in the bittersweet chocolate tart with smoked vanilla ice cream. The chocolate was as good as its name, not overpoweringly sweet. 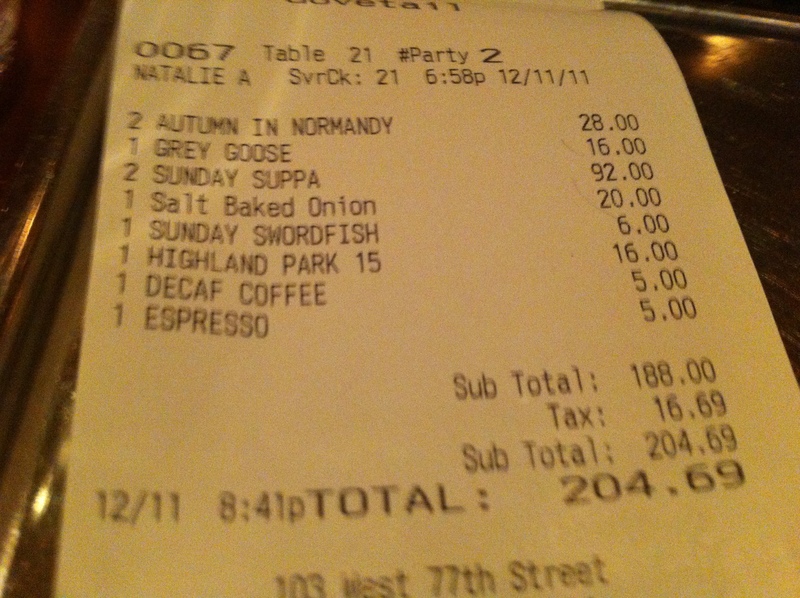 Keep in mind, we spent $60 on four cocktails, and got the pricey supplemental too... .
Look, there’s a good argument that says Dovetail is the best restaurant on the Upper West Side. I think the chef/owner is brilliant, and the food is utterly wonderful and winning. Transport yourself to the land of culinary excellence for the bargain price of $46 per person (plus drinks) on Sunday. You won’t regret it. ← Cascabel Taqueria Is Handy. A Bit Confusing At First, But Handy. The pastry chef is Michal Shelkowitz. And yes, she is indeed brilliant. As is Chef Fraser and his entire fabulous, wonderful staff. Can’t say enough about this place. Was just back tonight. 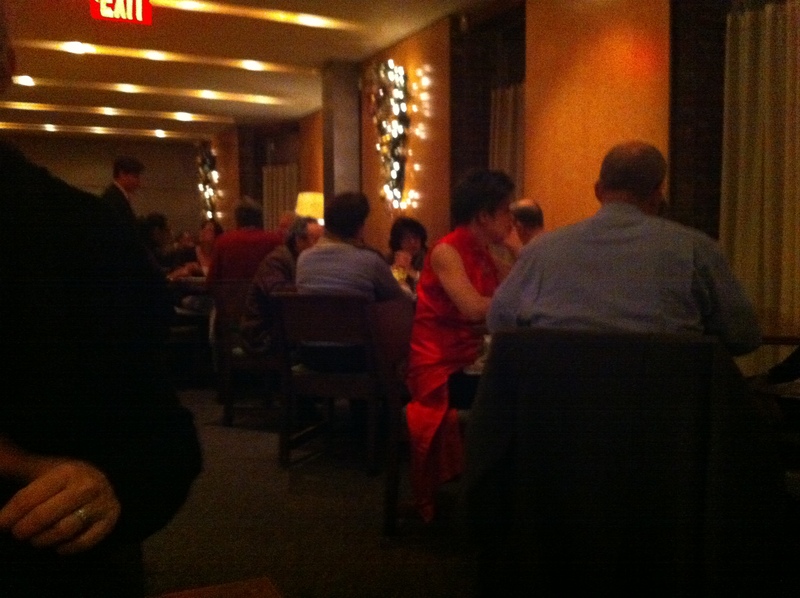 I think any serious person looking for tier one cuisine in NYC had better pay attention. I’ve been to Daniel and Jean-Georges, they should take note. Really wonderful. The flavors, the quality… It is really something. Especially for the price.